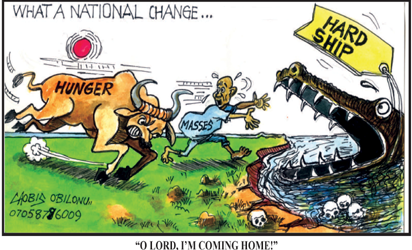 Home | News | General | Recession knocks at the door; fg ignores it. Recession knocks at the door; fg ignores it. “Failures are divided into two classes; those who thought and never did and those who did and never thought.” John Salak, VANGUARD BOOK OF QUOTATIONS, p 54. In the early 1970s, long before I ever thought that I would become a columnist, one of my co-tenants was a writer for the BOSTON GLOBE – the largest selling paper in the Northeast states of America. He read Economics and I used to wonder how he could forecast economic changes long before they occurred. One day out of curiosity, I asked him how he did it. He then showed me a computer-based model which he uses for economic predictions. Fascinated, I asked him to teach me the method. He was too happy to oblige me. Since then, I have made refinements to the model he left with me. Now, I have my own. Thus when the Central Bank of Nigeria, CBN, announced last month that Nigeria was tottering on the edge of another recession, there was no dissent from me. But, unfortunately, the CBN, unlike the US Federal Reserve Bank or the Bank of England, was talking to Federal government officials who are functionally deaf. The CBN Governor, Mr Emefiele might as well have been talking to herds of cattle. Even this article is not meant for the FG. They will ignore it until the recession hits us and then the official lies will follow – as usual. One question frequently asked of me is: how can you determine when economic down-turns will occur or when the Capital Market will enter into a tail-spin like a plane about to crash? Allow me to point out some of the tell-tale signs that we are heading for turbulence. Start with the annual budget. Budget not presented and passed by January of each year almost invariably means trouble because the stimulus for growth which should start from January is delayed until the budget is passed and implementation begins. None of the three budgets presented by the All Progressives Congress, APC, to the National Assembly, NASS, was passed before April. At least four months of growth had been lost before we started the annual journey. This year’s was the worst. There was no budget until June. Half the year was gone. Next year’s will be even worse. All the people who are employed to work on the budget are on the campaign trail. The President who does not understand economics, his Vice President who is only a little better and several Ministers are hustling for nominations. Nobody is minding the store. Irrespective of who becomes President in 2019, the immediate future is bleak. Then move to the major pillars of the economy. Crude oil, as everybody knows is the major one. Prices of crude have started to soar once again. Last week, they rose to over $86 per barrel. Ordinarily, that development should have Fellow Nigerians dancing in the streets. Why don’t we jubilate? We are not happy because the demands by our two biggest customers have dropped off. The US is not taking anything from us anymore and India has turned to the US for some of the oil once bought from Nigeria. Aggregate crude revenue has remained largely unchanged. Meanwhile, the FG continues to pile up loans which are expected to be repaid from crude revenue. Agriculture contributes a huge percentage of our national income. Herdsmen started first to devastate farms; Boko Haram scarred off many in the Northeast and flood has finished the disaster this year. Suddenly, Chief Audu Ogbeh, ever positive Minister of Agriculture, has raised alarm that Nigeria will not be able to produce sufficient rice to feed its people next year unless farmers plant anew. There are two problems with that statement. First, invariably, by the time governments raise alarm about anything, the situation had got worse than what they are describing. Second, many of the affected farmers now live in refugee settlements. They are nowhere near the farms that must be replanted. If and when they return to base building of shelter will be their top priority – not farming. I was in Sokoto, Kebbi, Zamfara and Niger States in August, September and early October; took some time to visit farms and it is a safe bet that nothing not yet planted will get planted this year. So, agricultural productivity will decline for 2018. Grown men don’t weep generally. But, Manufacturers must feel like the man who stubbed his toe hard in the dark. It hurts too much to laugh, but he is too old to cry. Finished goods stores are bulging with unsold stock nationwide. Advertisements and sales promotion campaigns have failed to move out the mountain and creditors are slow to pay. There is a noticeable drop in sales volume everywhere. Just ask the Manufacturers Association of Nigeria, MAN. When the mind turns to banks, it immediately encounters another major sector crying out for help. Skye Bank Plc gave way to Polaris Bank Limited. Right now, the former shareholders of Skye can kiss their investments goodbye. Finally, when more foreigners are checking out than are coming in, you can be sure they are taking their money with them in dollars. According to data from the Nigerian Stock Exchange, NSE, N435.41 billion was withdrawn from the Capital Market from January to July this year. Since you are probably reading this in October, more billions have fled in August, September and the first four days of October. Soon, it might be a mad rush for Murtala Mohammed International Airport. Nobody needs a lesson in Economics to realise that exchange rates will climb steadily; so will inflation and purchasing power will plummet. All these are happening now. Meanwhile, those we elected to take care of these things are treating the imminent calamity with total neglect. Obviously, they must labour under the impression that economic indices will wait until they are ready to address them. Poor Nigerians! Little do their leaders know that just as a month is a long time in politics, seven months is eternity for an economy on the verge of another recession.